Apple’s QuickTime for Windows has dangerous security vulnerabilities that may allow nefarious “hackers” take over your computer, but Apple says that they will not be releasing any security patches fix them. Quicktime, your time has come to an end. Annoyingly, Apple only announced this in a statement to Trend Micro. Apple hasn’t announced it on its own website, and doesn’t seem to be making a real effort to warn people about this outdated program. They’re even still offering it for download on their website without warning! If you’re using a Mac, don’t worry. Apple’s QuickTime for Mac is still supported with security updates. Only the Windows version is affected. If you have QuickTime on your Windows based PC, the good news is you probably don’t need it anymore. Microsoft Windows can run all the key Apple media formats that Apple’s QuickTime could, and iTunes on Windows no longer requires the program. 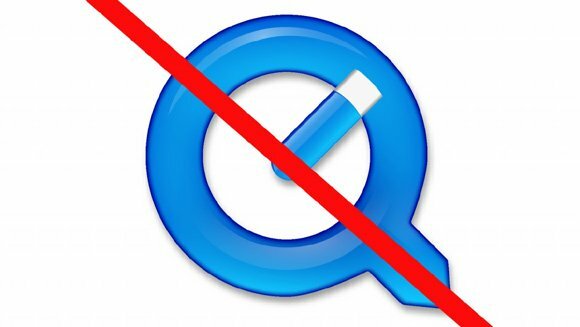 The only people who may need to keep QuickTime installed are those running a third-party program that depends on it, such as Adobe’s video editing software Premiere Pro. First, open up the Control Panel and click on Uninstall a program. You’ll find Control Panel in the Start menu. Type Quick or QuickTime into the search box, or scroll down the list of programs and look for Apples’ QuickTime. If it’s not there, there’s no need to do anything further. Just make sure you check all of your Windows PCs and laptops. Click on QuickTime in the list and click the Uninstall button (or double click on QuickTime in the list). If prompted, click Yes when asked if you really want to uninstall it. You may get another prompt from Windows, too. Even though Windows may not ask or require you to reboot your computer, I always prefer to reboot after uninstalling a program so that Windows can start fresh, and cleanup any remnants of the program from the uninstall process. You can go a step further and use the CCleaner program to scan for issues that are STILL left over. CCleaner is available to download for free. If you don’t have another program which can play .mov or .mp4 video files, I suggest installing VLC media player. It’s free and supports virtually every video format that you are likely to encounter on the web. In my opinion it is far superior to Quicktime or Windows Media Player.